PCD is a proprietary format by used by Kodak equipment that is designed for storing images on compact discs and for saving pictures created with Kodak photo processing hardware. As for technical characteristics, it should be noted that Kodak's PCD format has the resolution of 3072x2048 or 6144x4096 pixels and 24-bit color scheme. Talking about these advantages of PCD format, certain downsides should be mentioned as well. PCD files can only be viewed with expensive software, like Adobe Photoshop CS5 with Kodak Photo CD plug-in, Corel PaintShop Pro X4, Corel WordPerfect Office X5, ACD Systems Canvas 12, ACDSee Photo Manager 14, XnView and IrfanView. If you do not feel like spending lots of money on these programs, there's a great alternative. Simply convert PCD to PCX. PCX is a raster image format developed by ZSoft and is currently the original bitmap image formats for the DOS/Windows platform. It can easily be viewed not only with professional Adobe and Corel applications, but also with standard Microsoft Windows Picture and Fax Viewer. 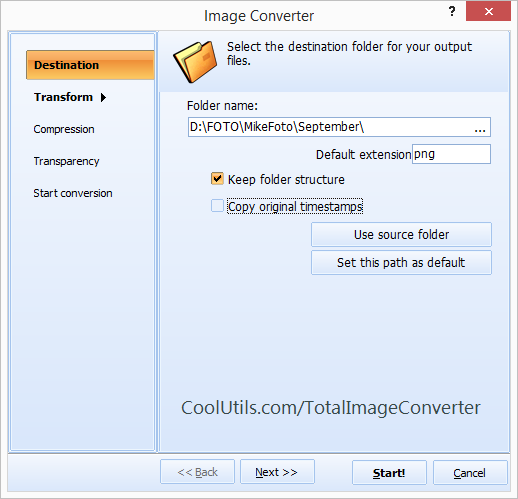 To convert PCD to PCX in batch, use Total Image Converter, a professional tool developed by CoolUtils. 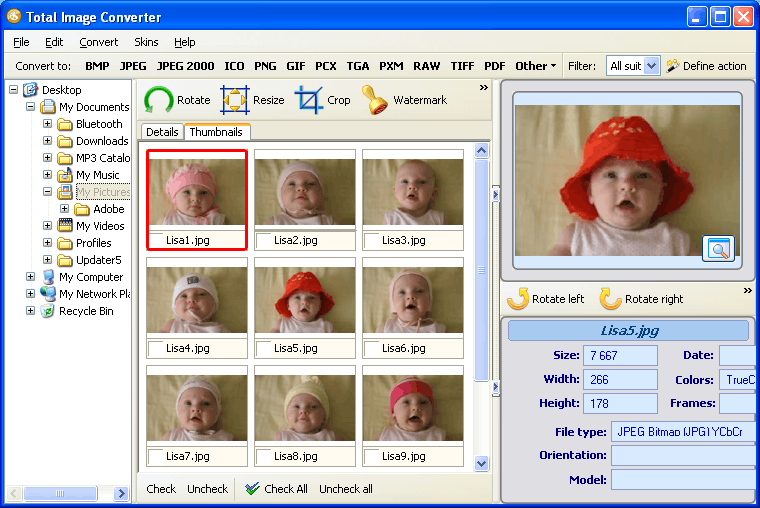 Even though this batch image converter is multi-functional, it has simple interface and can be mastered even by beginning users. 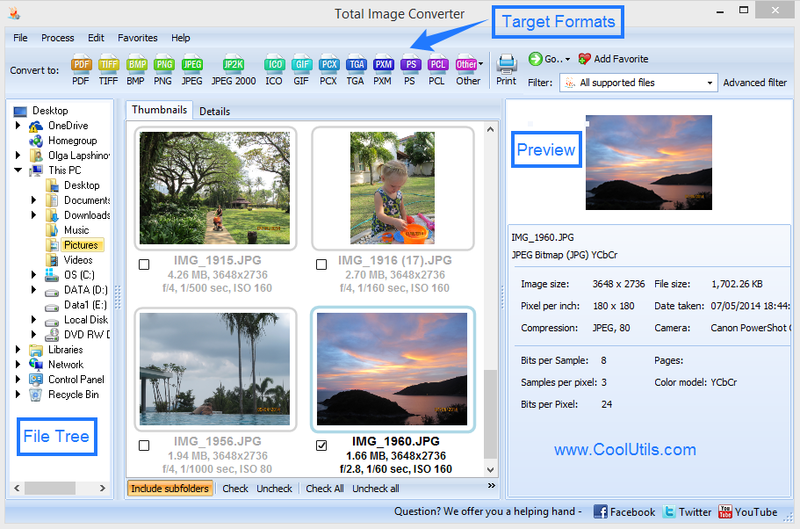 With PCD PCX converter by CoolUtils, you'll be able to not only convert files but also to edit them! As such, you can easily rotate, crop and resize files without third-party software. Finally, with this program you'll easily export files from PCD and other major image formats into PCX and TIFF, JPEG, RAW, PNG, BMP, PSD, TGA. Set target format and enjoy automatic conversion! 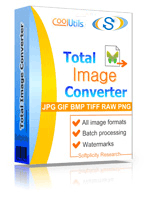 Get your free trial version of Total Image Converter here!